A sighting of this type, especially of such a rare lily is beyond imagination and rather than use it as an insert for the brown form of 'L. sherriffiae' we felt it deserved its own page. Our title photo as well as insert photo of a second and larger colony are courtesy of Mr. Sonam Wangchen of Bhutan and was taken in natural habitat. Mr. Wangchen operates 'Bhutan Excursions and can be reached at www.bhutantour.bt for those wishing to see this rare and delicate beauty in person. Only a hand full of people have viewed this lily in its native state while Mr. Wangchen walks along side them in an area of unsurpassed beauty. What Mr. Wangchen and his tours see in person is what most of us can only dream of. 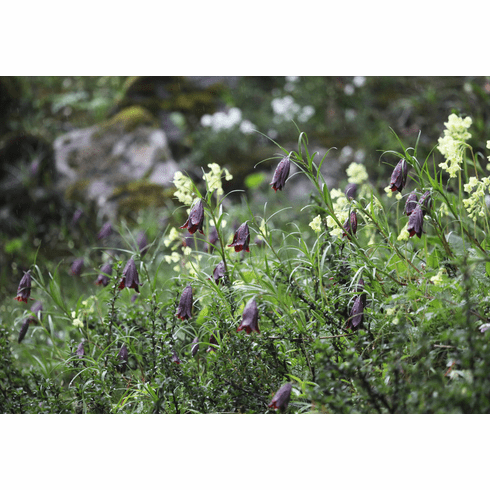 Photo copyright Mr. Sonam Wangchen, Bhutan Excursions, all rights reserved. Used with permission.